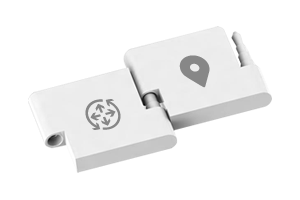 The idea of a modular device first appeared in the Phoneblocks project. This project introduced for the first time the concept of a smartphone made with interchangeable parts, fully adapted to consumer preferences. The idea sounds attractive in two very different ways. On one hand, we can purchase a device with the exact specifications that we are interested on, either by choosing the power of camera, the GB of RAM, the battery or the processor. On the other hand, it has a very interesting advantage related to the life expectancy of the device, as we can change any damaged with absolute freedom without changing the entire device. In fact, the idea went from theory to practice when Motorola announced its participation in the project, and the real possibilities of that project were so promising that when Motorola was handed to Lenovo, the Ara project remained in Google’s hands. Blocks follows a similar philosophy for smart watches. It is a fully customizable device consisting of small pieces of the watch’s strap or bracelet. 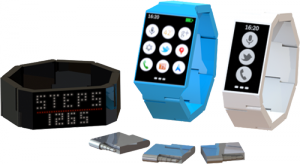 Each of these pieces is a component of the final device, and we can choose them so that it can be a simple quantifying bracelet to monitor our physical activity or it may even be a much bigger to have a fully functional smart watch with touch screen and gesture controls. 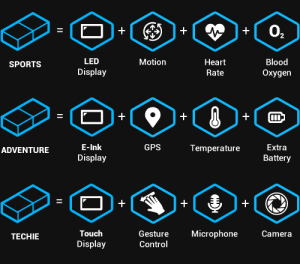 Among the different types of modules, we can find three different types of screen (e-ink, LED or touch screen), all kinds of sensors (such as heart rate, oxygen level or temperature), gesture control, GPS, camera, microphone or additional units of battery. Our final configuration will depend on the type of display and on the amount and type of other components we want to include. These components are also interchangeable, so we can improve any of them without removing the rest of the device. Thus, we can easily add more RAM, more memory or a camera with higher resolution. In addition, we can also replace any damaged module for a new one without any problem. It is designed to work with both Android and iOS devices, and it will use open source, so anyone can make applications and expanding the list of possible apps available. And not only the software is open, but also the hardware, so any manufacturer can create its own modules. The trickiest part of Blocks smart watch is the hardware. As the responsible commented to the TechCrunch, is not easy to manufacture modules with sufficient rigidity and strength to withstand everyday use. They should be waterproof, something also quite difficult with removable modules. Blocks smart watch is already in production, although the company expects the watch (or wristband) to go on sale in mid-2015. You can find more information on the Blocks’ website.